The wait is finally over, Samsung is all set for its Galaxy A9 India launch. 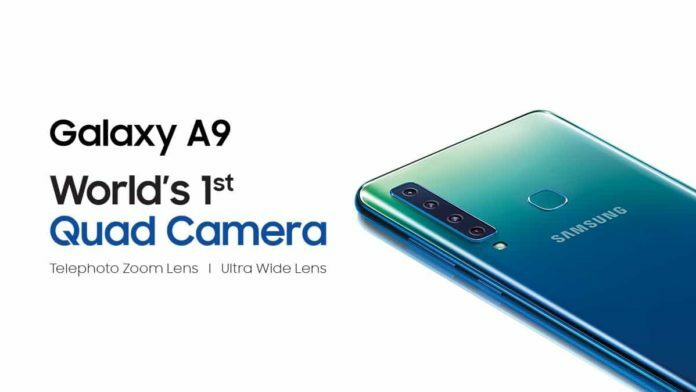 The entirely new Samsung Galaxy A9 is the world’s first quad-rear camera phone which made us wait for months. Last month Samsung did announce this smartphone in Malaysia, now it’s coming to India. Samsung has held an event in New Delhi; the live webcast of this event will begin at 12:30 PM. You can watch the launch event live on Samsung India’s official website. Samsung has already released this smartphone in Malaysia; It is available for around 599 EUR which translates to 48,900 in INR. We all know India is a very aggressive market, and Samsung could release this smartphone at a lower price tag. Recent leaks suggest that Samsung could release A9 (2018) at 34,999 INR in India. At this price point, Samsung A9 will be a fierce competition for OnePlus 6T. It is the worlds first smartphone with Quad Camera setup on the back. Samsung A9 (2018) has 4 rear cameras, the primary sensor is of 24-megapixel with f/1.7 aperture, the second lens is a telephoto lens of 10-megapixel with f/2.4 aperture and 2x optical zoom, the third camera sensor is an 8-megapixel 120-degree ultrawide lens and the last sensor is a depth sensor of 5-megapixel with f/2.2 aperture. All these four cameras need a powerful processor that’s why Galaxy A9 has Qualcomm’s Snapdragon 660 Octa-Core processor with Adreno 512 GPU. Upcoming Galaxy A9 has a notch less 6.3-inch Full HD Plus Super AMOLED display with 18.5:9 aspect ratio. Samsung may release this smartphone in 6GB and 8GB RAM variants. As far as internal storage is concerned, it will have 128GB onboard storage which can be further expandable up to 512GB via an external memory card. Samsung Galaxy A9 (2018) runs on Android Oreo 8.1 and Experience user interface on top of it. 3800mAh battery present on the A9 will support Fast Charging Technology. Galaxy A9 could come with three color variants, Caviar Black, Lemonade Blue, and Bubblegum Pink. Follow us on Instagram, Facebook, and Twitter for more updates on Samsung Galaxy A9 2018. जल गया जियो फ़ोन, जानिए क्या है वजह ! गुगल म्यूजिक पर चार महीने तक मुफ्त सुने लाखो गाने !